When he was a young monster, in elementary school, Mike Wazowski (Billy Crystal) took a field trip to Monster’s Inc., the company that powers a city by scaring children. Mike wants to be a scarer, but he isn’t very scary. By the time he gets to college, Monster’s University, Mike knows all the theoretical ways to scare children, but he still isn’t scary. James P. Sullivan is the opposite of Mike, big, hairy with legendary lineage, he should have a cakewalk at Monster’s U. But both Mike and Sully run into an intimidating Dean, Dean Hardscrabble, (Helen Mirren) who kicks both of them out of the Scare program, Mike for not being scary, and Sullivan for using only one technique, roaring. On the verge of heading for an exciting career as a scream can designer, Mike discovers a flier for the Scare Games, where fraternities compete to see who the scariest monsters are. He joins a fraternity of outcasts called Oozma Kappa, which finally has enough members after Sullivan joins. Mike and Sully are still rivals because of their different approaches to scaring, but can they put aside their rivalry to win the Scare Games? This is a funny movie, but it’s far too derivative of movies like Animal House and especially Revenge of the Nerds to be considered original. The writers even steal a scene from Carrie. That’s what happens when a sequel gets made 12 years after the original. Monster’s University is about a half hour too long, and suffers from a sudden shift in tone, when the movie turns serious. The story tries to be heart rending, but it’s not even close to the authentic tearjerker that Toy Story 3 or Despicable Me are. The animation is wonderful, bright and colorful, but there are some dark scenes, both in tone and content, and some scenes might be too scary for younger children. The movie is funny, but unfortunately, not because of Billy Crystal and John Goodman, who sadly are playing the same characters they played in the first movie, only younger. This is a movie that is saved by its secondary cast. Sean Hayes, Dave Foley, and Charlie Day were very funny, as were lesser known actors Peter Sohn and Joel Murray. I don’t think there will be another sequel, but Pixar made Cars 2, when I didn’t think there should have been a Cars 1. 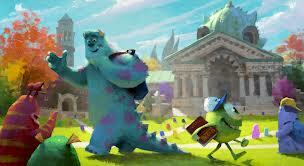 Monster’s University: Funny, to a degree.